The following poem was written by G T Wellman, and published in May 1943, the first anniversary of the Exeter blitz. It was privately printed, probably on a Gestetner stencil type duplicator and sold for 3d a copy. The money raised was put towards Exeter's Wings for Victory fund. 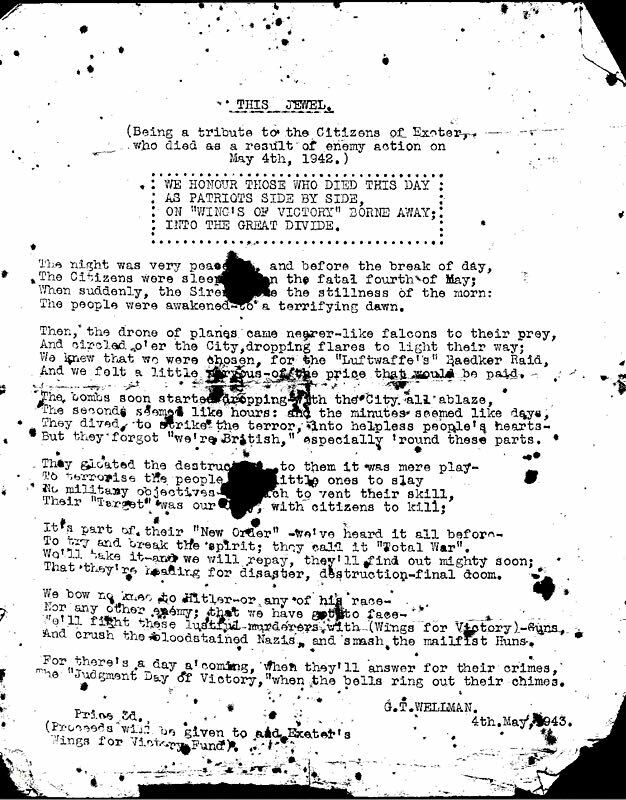 The poem was written as piece of propaganda, and as a morale raiser, in a Victorian melodrama style. May 1943 was a few months before the first US troops reached the city, in preparation for D-Day. The scan is from a copy owned by Allan H Mazonowicz, who found it tucked in some other papers related to Exeter in the 1950's. I have never come across the poem before, and this may be the first time it has been published since 1943. The author George Thomas Wellman was born in New Cross, Surrey in 1899. He and his other siblings were placed in orphanages in and around London, in about 1910. George enlisted in The Royal Berkshire Regiment on 12 May 1915, but due to being Shell Gassed, he was sent home to Blighty on 13 August 1918. It was during his time in the trenches, that George started writing poems. According to a newspaper article (Express and Echo Newspaper Article about him, dated Tuesday 16 September 1980) , and a piece written by his daughter Peggy (nee Wellman) Lewis, George had written a poem called “The Windy VC”. Sometime after his discharge from the army George settled in Exeter. He married a local girl called Violet, and they had three daughters in the 1920‘s – Peggy Lewis, Vera J. Capon and Beryl W.D. Goffee. These are their married names. 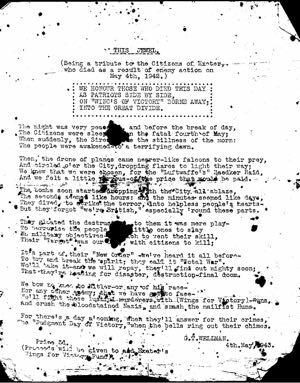 It was during the Second World War, that George became an Air Raid Warden, and had two of his poems privately published (there maybe more), selling at 3d a time, with proceeds going to The War Effort. ‘This Jewel’ was about the blitz, but he also wrote ‘Salute to a Soldier’. George died in Exeter in 1963. The people were awakened to a terrifying dawn. And we felt a little nervous - of the price that would be paid. But they forgot "we're British," especially 'round these parts. To try and break the spirit; they call it "Total War". That they're heading for disaster, destruction - final doom. And crush the bloodstained Nazis, and smash the mailfist Huns. The "Judgement Day of Victory," when the bells ring out their chimes. I would like to thank Michelle May for the biography of George Wellman. Additional research about George from Norman Sellick, Marianne Bulford Clegg and Pat Follett. If anyone has any information about George T Wellman, please contact me on the EM email address below.